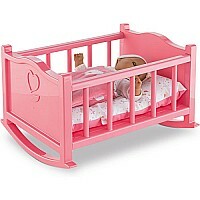 It's "nitey-nite" for a favorite baby doll in Corolle's Mon Premier Small Doll Cradle, the perfect size for a Calin or Bath baby doll (sold separately) or for any baby doll up to 12 inches tall. 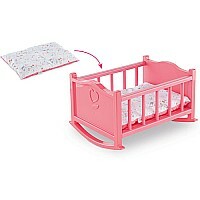 Part of Corolle's Mon Premier Collection for ages 18 months and up, the Baby Doll Cradle includes a mattress with a charming bunnies print pattern. 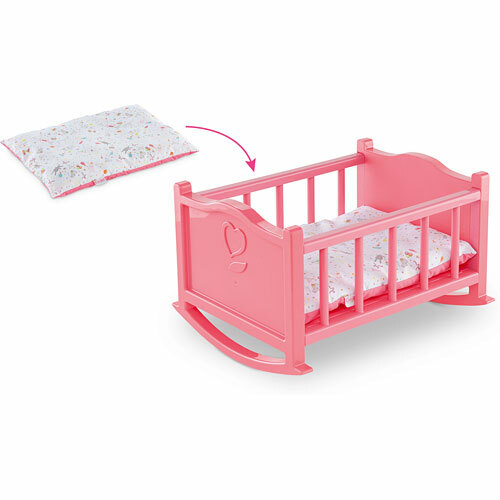 Made of high-quality plastic and with styling inspired by the real thing, Corolle's Small Doll Cradle includes a bunny-print mattress. A charming addition to any baby doll nursery, it measures a space-efficient 14.6 inches long and 12 inches wide when assembled and fits dolls up to 12 inches tall. 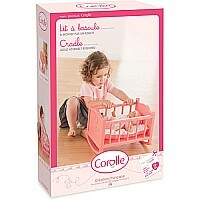 Little ones love taking care of their baby dolls the way their parents take care of them. Designed in France, the Mon Premier Cradle is part of Corolle's Mon Premier Collection that offers everything ages 18 months and up need for nurturing pretend play with their favorite Calin or Bath baby doll (each sold separately), whether it's dressing, feeding, on the go, at bath time or at bed time.